Why Is Ukraine Supporting Syria’s Assad? KIEV, Ukraine -- Syria grows increasingly isolated as President Bashar al-Assad's soldiers continue pounding anti-government protesters with a ferocity that has earned the wrath of much of the world. 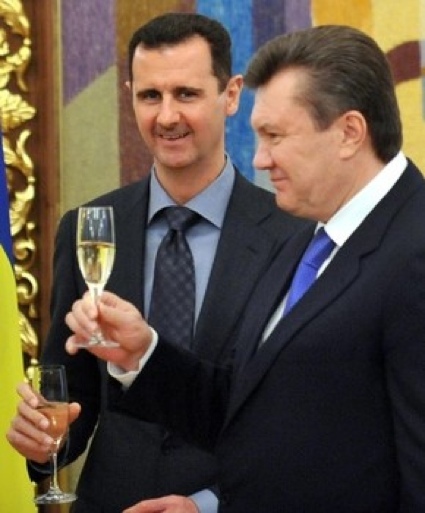 Ukraine's President Viktor Yanukovich (R) toasts Syrian counterpart Bashar al-Assad in Kiev in December 2010. Western nations and most Arab states have turned against Syria, with several clamoring for military intervention to end the bloodshed that has claimed at least 7,500 Syrian lives after nearly a year of unrest. Assad's allies can be counted on the fingers of one's hand -- Russia, China, Iran and perhaps one or two others. However, the butcher of Damascus has another, less prominent ally: Ukraine, the former Soviet republic. In fact, Assad recently spoke to members of the Ukrainian parliament in Syria's capital, despite the global outrage toward the bloody crackdown. During his speech, Assad repeated the tired cliché that the troubles in his country are being caused by foreign agents and armed terrorists seeking to destabilize Syria. According to Syria's state-controlled SANA news agency, some members of the Ukrainian delegation expressed solidarity with Assad and opposition to foreign intervention in the Middle Eastern country. Ukrainian and Syrian officials also apparently pledged to deepen bilateral relations, especially in technological development and education. The relationship dates back to 1992, when post-Soviet Ukraine claimed independence. Indeed, Syria was one of the first foreign nations to formally recognize the new Ukrainian state, although Syria didn't open an embassy in Kiev until 2004. According to the Ukrainian Embassy in Damascus, Syria is one of Ukraine's biggest trade partners in the Middle East, with projects in energy, oil, agriculture and natural resources. Bilateral trade amounted to about $1.5 billion in 2010. In an interview with Ukrainian media in January 2011 (before the outbreak of the current revolt), Syria's ambassador to Ukraine, Suleiman Abudiab, said: "Syria is ahead of other Arab and African countries in the amount of trade with Ukraine." "Syria imports metal, timber, raw materials for food production and other things from Ukraine. Syria would want to export to Ukraine Syrian textiles which are cheap and of good quality, fruit and olive oil." Abudiab added: "In the past, Ukrainian engineers and workers took part in building electric power stations and carried out other projects, and now what was built then is in need of renovation and repair. Ukrainian specialists as well as medical doctors and teachers would be very welcome in Syria." The ambassador also pointed out the presence of a significant Syrian community in Ukraine. "Mostly, they are those who studied here," he said. "Some of them are successful businessmen; others have achieved success in other spheres. ... There are quite a few Syrians -- as many as 15,000 -- who studied at Ukraine's universities and now live in Syria." "Most of them are quite successful in their lines of business and work. Many of them are married to Ukrainian women." Last October, deep into the crackdown by the regime, a group of Ukrainian politicians visited Syria in a show of support for Assad and condemned "global media" for falsely reporting the events in the country. Alla Alexandrova, head of the delegation and a Communist member of the Verkhovna Rada, the upper house of Ukraine's parliament, told Syrian state media at the time: "Sadly, the Ukrainian media often gets its information from global mass media, so we came here to verify the reality of what is happening for ourselves." She also said during another visit to Damascus: "Ukraine stresses its support to Syria and rejection of foreign interference in its affairs. Ukraine also stresses support to dialogue among all the Syrian sides." It's unclear what degree of support Assad enjoys among Ukraine's people. There appeared to be no reports of protests in Ukraine regarding Assad. Dilshod Achilov, professor of political science at East Tennessee State University, finds the apparent Ukrainian government support for Syria at this tumultuous time strange. "One possible explanation is that [Ukraine's President] Viktor Yanukovich ... is known for his close ties with Vladimir Putin," Achilov said, referring to the newly elected Russian president. "It is possible that Mr. Yanukovich has acted in this odd way while being under pressure from Russian officials. Russia is trying hard to keep Assad in power as long as -- and at whatever cost -- possible." Achilov said he believes any underlying Ukrainian support for Assad rests on the anti-Western -- and staunchly pro-Russian -- sentiments of the new leadership in Kiev. "From day one, Ukraine was and still is against any foreign military confrontations, especially by NATO," he said. "In the light of what Assad has been doing at home (massacring civilians with disproportionate military force), it was highly unwise and irresponsible of Ukraine to show solidarity with the current Syrian regime." "This will likely impact future Syrian-Ukrainian relations in the post-Assad Syria in the near future."